Contributing writers John and Sandra Nowlan experience the tastes of Texas on a tantalizing food trail from Forth Worth to Dallas. Warning: Do not read this post when hungry. We knew we had truly arrived in Texas when the breakfast room at our upscale Fort Worth hotel played nothing but country & western music on its PA system and the sign at the door warned against entering with unlicensed firearms. We’ve visited this part of the U.S. on several previous occasions and, in spite of typical Canadian trepidation about guns and violence, have never failed to be impressed by the genuine hospitality, tons of attractions and outstanding cuisine of the Lone Star State. Our home in Fort Worth was the Omni Fort Worth Hotel, perfectly located downtown next to the Convention Centre and the unique Fort Worth Water Gardens. The large rooms were quiet, comfortable and well-equipped. But we didn’t spend much time there since we wanted to explore this historic city with so many ties to the Old West. The Fort Worth Stockyards National Historic District is a must-stop for visitors. In the late 1800s the city was known as “Cowtown” when four million head of cattle were driven through the community en route to the Chisholm Trail. That tradition continues twice a day (11:30 am and 4:00 pm) as Texas cowboys and cowgirls in traditional garb drive a herd of longhorns along the main street of the District, passing storefronts that could be from the “Gunsmoke” era, selling Stetson hats, western boots and sizzling steaks. One of our goals on this trip was to sample a variety of Texas cuisine and on our first day we were treated to some typical dishes and some that were unique. After a walking tour of downtown Fort Worth (urban revitalization has turned the area into an attractive and safe center for shopping, restaurants, live theatre and galleries) we visited Salsa Limon, a former food truck now a permanent restaurant serving authentic Mexico-city style street tacos, burritos, quesadillas and molca bowls (rice topped with black beans, onions, cilantro, cubes of grilled beef or chicken, shredded cabbage and avocado). That evening a local food writer, June Naylor, joined us for dinner at the Clay Pigeon, known for its emphasis on boldly flavored local fare including fire-roasted bone marrow on toasted sourdough and spicy-pork flatbread. She told us that the Mexican trend is evident throughout the city and almost everyone, even the Asian restaurants, makes some variety of taco. Farm-to-table food is increasingly important, she added, and smoke is a key element in many North Texas restaurants. The next day our immersion in Texas cuisine continued along the so-called “Restaurant Row.” Magnolia Avenue is a magnet for hungry and thirsty patrons who want an authentic taste of Texas. Brewed was an ideal first stop for great coffee and huge breakfasts like eggs, grits and Applewood bacon, pulled pork hash and fried chicken and waffles. Substantial enough to hold you for a full day. But we ate lightly because our next stop on Magnolia Avenue was at Hot Damn Tamales where a tamale rolling class was scheduled. The owner laughed as she told us that the shop’s name (apparently Elvis Presley made the comment after he flubbed a recording) raised eyebrows “here in the Baptist Belt” when it began 20 years ago. “One 80-year-old lady kept calling us just to hear the ‘D’ word.” The shop now makes and serves up to 200 dozen tamales a day and we learned the mixing and rolling secrets of black bean tamales. Hot Damn, they were good! Along Magnolia, we also stopped for some wonderful Texas Barbeque at Heim’s, at Stir Crazy for baked goods (organic cupcakes, muffins, cookies and sweet rolls, some made with cayenne pepper, Texas pecans and Texas whiskey) and Melt Ice Creams, where creamy concoctions like “Honey & Thyme” and “Pear & Blue Cheese” flavors are made from scratch. Like elsewhere in North America, craft beer is a booming industry (up 11% this year in Texas) and we visited three of the ten small breweries along the Ale Trail. All are very small (just 265 barrels in 2015 at the Collective Brewing Project) to medium (18-20,000 barrels a year at Rahr Brewing) but the taste far surpasses the industry giants. The Rahr brewer told us that the Miller Beer plant, just down the street, spills more in a day that he makes in a year. Fort Worth and Dallas are essentially twin cities and we continued our North Texas “Tastes of Texas” tour with a couple of days in the 9th largest US metropolis. Our hotel in Dallas was the The Joule Hotel (pronounced like Jewel, it lives up to that name), a converted 1920s bank building. Its lobby is filled with unique art including a collection of colorful mosaics that were salvaged from a construction site. 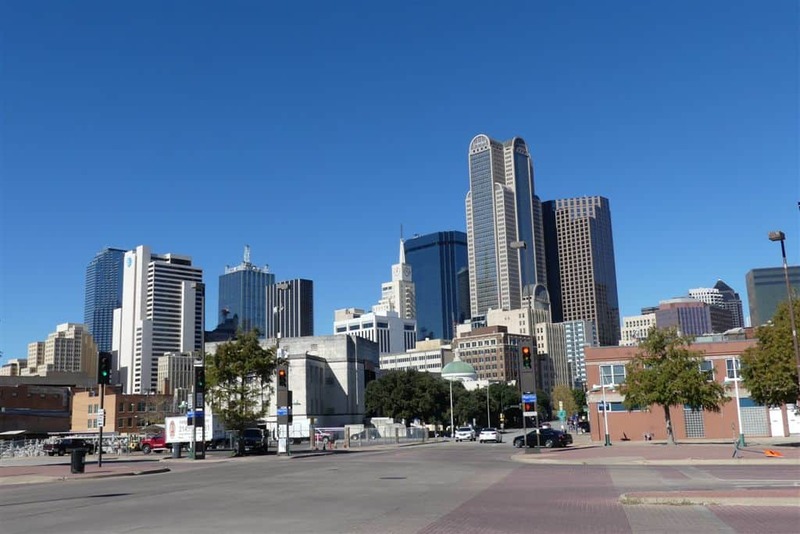 Dallas is a wonderful city for walking or touring its various neighborhoods. Two tall and iconic structures dominate the area. The Margaret Hunt Hill Bridge is basically a large white arch, as tall as a 40-story building, supporting a roadway with five miles of cables. The Spanish-designed bridge opened in 2012 at a cost of $117 million. The other landmark is the 560-foot Reunion Tower (locally called “The Ball”), an observation tower with splendid panoramic views of the city. Our afternoon was spent walking and shopping (there’s a Trader Joe’s nearby) and enjoying some unique confections. Kate Weiser Chocolate specializes in hand painted chocolates with jewel-like designs. Almost too pretty to eat! And Steel City Pops makes organic popsicles for grownups in flavors like jalapeno and sweet potato pecan. Mexican cuisine is, of course, everywhere in Dallas and one of its best purveyors is El Bolero. The menu comes from the diverse regions of Mexico with food that is colorful, authentic and very tasty. Even Chinese restaurants are influenced by the Texas border with Mexico. Chino Chinatown in the Trinity Groves area of Dallas offers wonderful Asian dishes with a Latin touch. Its sesame seared Ahi tuna was especially delightful. Barbeque is a traditional Texas specialty and the busiest BBQ pit in Dallas has to be Pecan Lodge. With a lineup that always seems to stretch out the door and along the block, this purveyor of succulent ribs, pulled pork, brisket and sausages typically feeds 3-4000 patrons on a Saturday. The pitmaster told us it was a 24-hour-a-day operation that goes though three-four tons a brisket a week, all carefully cooked and smoked for 15-18 hours over oak and hickory. Our final dinner before flying home was at a most unusual restaurant that left its guests with a feel-good attitude as well as a full stomach. Café Momentum serves New American, Farm-to-Table and Modern Southern cuisine but helps transform the lives of young people in the process. A team of dedicated chefs and counselors employ at-risk youth who have spent time in juvenile facilities, train them, encourage them and cheer them as they often enjoy the first gainful employment of their lives. Entrees like smoked fried chicken, beef fillet and duck with molé sauce are cooked and served with flair and enthusiasm by young people whose lives are turning around. It’s a great concept and a credit to Texas and its can-do attitude. Disclosure. The Nowlans were guests of Texas Tourism but any opinions expressed in this post are their own. I used to live in Denton, near both Dallas and Ft. Worth, but have been away for five years now. I enjoyed your post and learned about some places I hadn’t visited while living there. There was always someplace new to go and things to see there. It’s a great area to explore! We visited the Dallas-Fort Worth area last December but didn\’t get to eat at any of these restaurants. This post is really whetting my appetite and having me plot a return trip. I\’d really like to try that tamale rolling class. I know the guy who designed the logo over a decade ago but didn\’t realize that the operation was now located in Fort Worth. I visited family in Dallas years ago, but it didn’t even occur to me at the time to explore Texan cuisine beyond Tex-Mex. Oh well, next time. I loved the historic district of Fort Worth though. It’s charming now, but must have been pretty grimy and nasty in the cattle drive days! Texas is an amazing place. Loved the interesting and informative post and the great photos.